Microsoft Access is a database development software application used to create, edit, and analyze relational databases. Business Computer Skills now offers Microsoft Access training classes in Greenbelt, MD. Get the professional training you need to take your Access skills to the next level. Whether you want to learn Access database basics, master joining tables and reporting, learn about Access VBA, or are working towards an MOS Access certification, we have the right course for you. Microsoft Access 2016 Introduction Classes (Level 1) -- Our introductory Microsoft Access 2016 course helps students become familiar with the new Access program, and learn all the core operations of the program. Students will learn Access Fundamentals and gain proficiencies in the following areas: Creating Databases, Working with Tables, Working with Data, Creating Relationships, Using Forms, Running Queries and Working with Reports. These are great classes for those who need a refresher in Access 2016 or are looking to build fundamental skills in the program. Microsoft Access 2016 Introduction Training Courses. Microsoft Access 2016 Intermediate/Advanced Classes (Level 2) -- Our intermediate/advanced course for Access 2016 builds off of the Level 1 class to put your core skills to work. Students will gain proficiencies in the following areas: Planning a Database, Building the Structure of a Database, Finding and Joining Data, Create Flexible Queries and Customizing Reports, Customizing Field Properties, Defining Relationships, Creating Advanced Queries, Producing Reports, Integrating Access with Different Technologies, Establishing Database Security, Using Database Maintenance Tools and Using Access as a Development Tool. This is an ideal course for experienced Access users who want to fully utilize Access 2016.Microsoft Access 2016 Intermediate/Advanced Training Courses. Access 2016 Programming with VBA Our Access 2016 VBA course helps the use lear how to program in Access in order to automate certain processes and tie database objects such as tables, form and reports together. users should be well versed in the Introductory and Advanced Access 2016 course material before taking this class. The course focuses on the following areas: Working with Procedures and Functions, Understanding Objects, Expressions, Variables, Intrinsic Functions, Working with Recordsets, Controlling Program Execution, Code Debugging and Error HandlingMicrosoft Access 2016 Programming with VBA Training Courses. Microsoft Access 2013 Introduction Classes (Level 1) -- Our introductory Microsoft Access 2013 course helps students become familiar with the new Access program, and learn all the core operations of the program. Students will learn Access Fundamentals and gain proficiencies in the following areas: Creating Databases, Working with Tables, Working with Data, Creating Relationships, Using Forms, Running Queries and Working with Reports. These are great classes for those who need a refresher in Access 2013 or are looking to build fundamental skills in the program. Microsoft Access 2013 Introduction Training Courses. Microsoft Access 2013 Intermediate/Advanced Classes (Level 2) -- Our intermediate/advanced course for Access 2013 builds off of the Level 1 class to put your core skills to work. Students will gain proficiencies in the following areas: Planning a Database, Building the Structure of a Database, Finding and Joining Data, Create Flexible Queries and Customizing Reports, Customizing Field Properties, Defining Relationships, Creating Advanced Queries, Producing Reports, Integrating Access with Different Technologies, Establishing Database Security, Using Database Maintenance Tools and Using Access as a Development Tool. This is an ideal course for experienced Access users who want to fully utilize Access 2013.Microsoft Access 2013 Intermediate/Advanced Training Courses. Access 2013 Programming with VBA Our Access 2013 VBA course helps the use lear how to program in Access in order to automate certain processes and tie database objects such as tables, form and reports together. users should be well versed in the Introductory and Advanced Access 2013 course material before taking this class. The course focuses on the following areas: Working with Procedures and Functions, Understanding Objects, Expressions, Variables, Intrinsic Functions, Working with Recordsets, Controlling Program Execution, Code Debugging and Error HandlingMicrosoft Access 2013 Programming with VBA Training Courses. Microsoft Access 2010 Introduction Classes (Level 1) -- Our introductory Microsoft Access course helps students become familiar with the Access program, and learn all the core operations of the program. Students will learn Access Fundamentals and gain proficiencies in the following areas: Creating Databases, Working with Tables, Working with Data, Creating Relationships, Using Forms, Running Queries and Working with Reports. These are great classes for those who need a refresher in Access 2010 or are looking to build fundamental skills in the program. 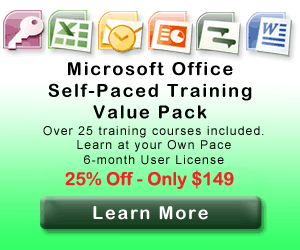 Microsoft Access 2010 Introduction Training Courses. Microsoft Access 2010 Intermediate/Advanced Classes (Level 2) -- Our intermediate/advanced course for Access 2010 builds off of the Level 1 class to put your core skills to work. Students will gain proficiencies in the following areas: Planning a Database, Building the Structure of a Database, Finding and Joining Data, Create Flexible Queries and Customizing Reports, Customizing Field Properties, Defining Relationships, Creating Advanced Queries, Producing Reports, Integrating Access with Different Technologies, Establishing Database Security, Using Database Maintenance Tools and Using Access as a Development Tool. This is an ideal course for experienced Access users who want to fully utilize Access 2010.Microsoft Access 2010 Intermediate/Advanced Training Courses. Access 2010 Programming with VBA Our Access 2010 VBA course helps the use lear how to program in Access in order to automate certain processes and tie database objects such as tables, form and reports together. users should be well versed in the Introductory and Advanced Access 2010 course material before taking this class. The course focuses on the following areas: Working with Procedures and Functions, Understanding Objects, Expressions, Variables, Intrinsic Functions, Working with Recordsets, Code Debugging and Error HandlingMicrosoft Access 2010 Programming with VBA Training Courses. Self Paced Online Access Courses: - Our Access online training classes are perfect for students who are comfortable with self-directed learning. The self-paced classes cover similar material as the instructor led courses, and are accessable to students 24-7 for a 6 or 12-month license period.